Our BNI Gold Club members add value to their chapter by increasing the contact network of every member of the chapter, which means more business for everyone! BNI Gold Club was established to recognize those members who go the extra mile in building their chapters by introducing six or more professionals into the organization who subsequently become members. BNI Gold Club members are easily recognizable because they wear a black name badge given to them in appreciation of their efforts. These members also enjoy the privilege of a raised profile on the BNI website, BNI Connect Global and Regional Events. Only 10% of the people in BNI across the world have a Gold Club Membership. 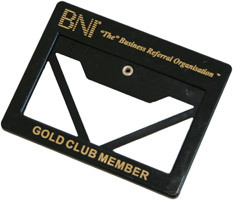 To qualify for Gold Club, a member needs to sponsor at least (6) new members into BNI. Please submit your information below for Director approval.